Like food pics? You’ll find them here! If you are in business, chances are there are times, including Christmas, when you wish to say a special thank you to staff, clients or partners. 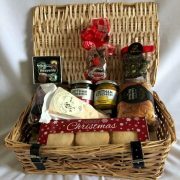 Rather than a generic retail hamper, we hope you’ll consider you’re a bespoke hamper, full of locally sourced, quality ingredients with your own branding inside. Of course, hampers are not exclusively for Christmas, but this one produced for one of our corporate clients should demonstrate the kind of gift you can expect. Modens Handmade Christmas Cake: Rich and most and brimming with fruit inclusions and hand-finished with luxurious nuts and cherries. Lincolnshire Poacher: An award winning Cheddar-like cheese from Simon Jones’ own herd of Holstein Friesian cows. Modens Plum Bread: Locally renowned, individually hand-baked since 1936 and award winning lightly spiced fruit loaf – fantastic with cheese. Modens 6 Mince Pies: Crumbly, buttery, traditional shortcrust pastry encasing luxury mincemeat and topped with a sprinkle of sugar. The Bytham Kitchen Piccalilli: Handmade by Andy Heaps; this is his personal favourite, not too sweet and with a little kick. The Bytham Kitchen Caramelised Red Onion Chutney: Also handmade by Andy Heaps, we think it’s the perfect accompaniment to Christmas fayre. SHC Christmas Truffles: 4 festive truffles made by Barbara Farrow at Stamford Heavenly Chocolate. SHC Honeycomb: A goody bag of honeycomb also from Stamford Heavenly Chocolate. Infiniteas Christmas Tea: A pack of Karen’s Christmas blend tea from Stamford based Infiniteas. Please contact us 07734 701142 or use this link for your enquiry. Please refer to individual product packaging for refrigeration requirements and use-by dates. Minimum order quantities apply. 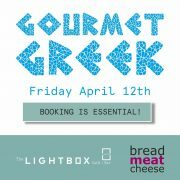 We are back at The Lightbox Café:Bar in Peterborough City Centre on Friday 12th April. If you have already enjoyed our “Posh Dogs” or “Bao Wow Buns”, our “Feast from the Middle East” or the “Macho Mexicano” pop-ups at the Bridge Street venue, then imagine the very best food you have eaten on a Greek holiday and book your seats now. The three course menu kicks off with a trio of made-from-scratch meze with pitta: Tirokefteri (spiced feta), Fava (split yellow pea puree) and Hummus (chickpea and tahini). The centre piece of the main course will be a traditional Lamb Kleftiko, which for those who haven’t had the pleasure, is a long gentle cook of lamb on the bone with garlic, oregano, lemon and potatoes sticky with all the flavours. To accompany the lamb will be Gigandes Plaki, large butter beans in a homemade tomato sauce alongside a simple Horiatiki fresh salad and Tzatziki. A vegetarian option of roasted vegetables with a white bean Skordalia will be available on a pre-ordered basis. While the Greeks are perhaps best known for sweet desserts such as baklava and galaktoboureko, we discovered on our travels to the inland Cretan village of Gavalochori a “kéik” made with honey and orange, served on this occasion with a Greek yoghurt ice cream, what’s not to like? These BMC pop-ups sell out quickly so to book your tickets priced at £25 per head, call in to The Lightbox on Bridge Street or call 01733 894444. 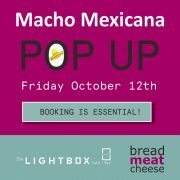 Pop-up pros Bread Meat Cheese will be making a welcome return to The Lightbox Café : Bar on Friday 12th October. Always a popular event and a guaranteed sell-out, the chefs are bringing a three course Mexican street-food menu to the Bridge Street venue. BMC chef Claire Morgan, lived, worked and cooked in Tequila, Guadalajara & Puerta Vallarta. Calling upon typical “Nuevo Latino” inspiration, she has created an authentic street-food menu packed with the vibrant fresh herbs, zingy spices & smoky flavours of the real Mexico. The late, great American celebrity chef Anthony Bourdain, said “Mexico has the most misunderstood and underrated cuisine on earth” so here is a chance to savour the real thing. The menu kicks off with “Streetcorn”: grilled corn on the cob, scorched jalapeno and lime crema with feta cheese. Your main course will be “Taco de Pato”: “Cantina” spiced shredded duck, mango, and pickled red onion, sesame, lime, radish and cucumber salad, nachos and imported “Valentina” hot sauce on the side. A vegetarian alternative of “Taco de Calabaza” with roasted squash, chard and pumpkin seed is available if pre-ordered at the time of booking. For dessert, the team are serving “Buenas Noches, Montezuma”: chocolate, tequila reposado, cinnamon, cayenne & orange mousse, the title a nod to the 16th Century Aztec king who believed chocolate to be the food of the gods. Tickets are available from The Lightbox Café : Bar on Bridge Street in Peterborough, 01733 894444, priced at £20. Be aware though, at the time of this article being posted, considerably more than half the tickets have already been sold. I just wanted to say huge thank you for your help on Saturday to make our Anniversary Party a success. My friends know I hate organising things as my track record is not good! We had a great time partly thanks to you handling the food and taking that worry/hassle away. 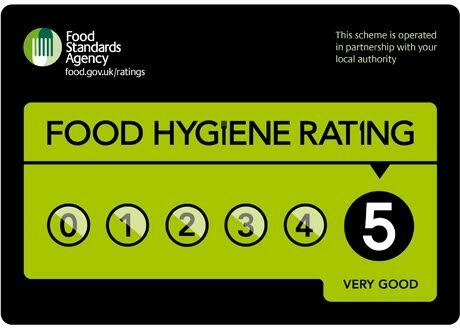 We have only had positive comments from our family and friends about the Reuben burgers and we thoroughly enjoyed having you there. My next party  you are top of my list. We will be back at The Lightbox Cafe:Bar in Peterborough on Friday 13th July. Rather than just a pop-up, this time we will be cooking a 5-course Middle Eastern menu for our diners to enjoy, a convivial & relaxed, “elbows on the table” evening. 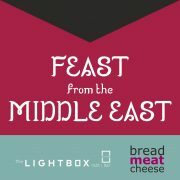 The menu of Feast from the Middle East is priced at £23.95 per person and booking is essential with tickets already selling fast. The event is to celebrate the launch of a new wine menu at The Lightbox – pairing wines specially selected by Amps Wine Merchants will be available to buy on the night. Three of our favourite mezze dips: a classic hummus; feta haydari with honey; a beetroot tzatziki. Warm king prawn salad with pink radish & red onion with za’atar & orange dressing. Spice marinated & slow cooked local lamb shoulder served with dried fruits, cous-cous, sekanjabin (mint syrup) & fresh salads. Dessert #1 is an individual blueberry, lime & ginger “cheesecake”. Dessert #2 is a chocolate, orange & cardamom mousse with honeycomb. To book, please call The Lightbox on 01733 894444. 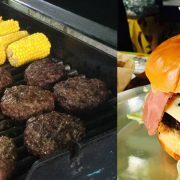 Peterborough’s Lightbox Café : Bar has announced details of its latest artisan street food event with their pop-up partners Bread Meat Cheese, to be held at the Bridge Street venue on Friday 18th May. “Bao Wow!” is priced at £12.95 per head with guests sampling an authentic taste of Asia with a tray of three different hirata “buns” including a glass of Prosecco, wine, beer or soft drink. Gua Bao (steamed buns) has been Taiwan’s most popular street food for years but when legendary New York chef David Chang put his version on the menu at Momofuku in 2009 they went global. Today you can queue for hours to eat these fluffy, pillowy buns stuffed with exotic Asian flavours at London bao shops such as five venue “Bao”, Peckham’s “Mr Bao” & winner of the British Street Foods Awards 2016,”Le Bao” food-truck. 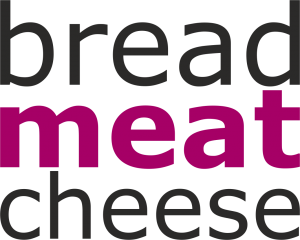 So now’s your chance to enjoy the authentic street food taste with a set menu of 3 of the favourites from Bread Meat Cheese at The Lightbox, without the queue! Home cooked, filled prawn crackers, homemade Asian slaw and other sides will be also be available on the night. Booking is essential via The Lightbox Café on 01733 894444 or www.thelightboxcafe.co.uk or simply by calling in. 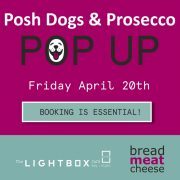 Peterborough’s “day : night” venue The Lightbox Café has announced details of its next pop-up; “Posh Dogs & Prosecco” will take place on Friday 20th April and is the latest joint venture with pop-up specialists and left-field outside caterers Bread Meat Cheese. Priced at £12.95 per head, diners will enjoy a very special dog from the concise menu, a house slaw made from five different members of the onion family and a glass of Prosecco, beer or soft drink. Twelve, All Saints, the popular, sister establishment to The Wine Bar in Stamford, is playing host to our “Posh Dogs & Prosecco” pop-up on Thursday 15th March. The menu will include a New York Reuben Dog , which is a 26cm all beef, allergen-free hot dog in a brioche roll with “Swiss”, Russian dressing, dill pickle, crispy onion & American mustard. The Tokyo Doggie has the “dog” accompanied by wasabi mayo, nori seaweed, crispy onion & chilli & orange shichimi seasoning and the Mumbai Dog promises to please the palette with the addition of mango chutney, Mumbai mayo, tomato, onion, mint & onion seed salad. All dogs are served with BMC’s house 5-onion slaw. 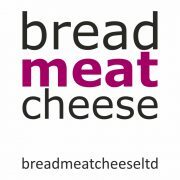 The Bread Meat Cheese team will be serving from 7pm. The Lightbox Café in Bridge Street, Peterborough, is playing host to a very special Mexican pop-up on Friday 23rd March. The highly popular, licensed “modern tea room” has invited our innovative outside catering to offer customers a true taste of Latin America. BMC has recently expanded its team, with the well- known “Macho Burrito” queen Claire Morgan joining, a lady who has spent a great deal of time living and cooking in Mexico, Ecuador and Argentina. Promising to be something rather different to the mainstream fayre, the menu will include burritos of Barbacoa beef cheek, Pollo Loco, and a Viva Vegan which will all be served with Pica de Gallo, queso, crema, jalapeno and refried beans. The burritos will be accompanied by a side of Mexican slaw with a choice of authentic Valantina hot sauce or the muy picante Valantina Black Label. 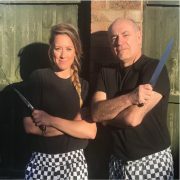 The Bread Meat Cheese team of Jim and Nigel Davis and of course Claire, will be serving from 7pm. Pre-booking is required and this can be done at The Lightbox Café at 31 Bridge Street or via www.thelighboxcafe.co.uk where further information will be posted.